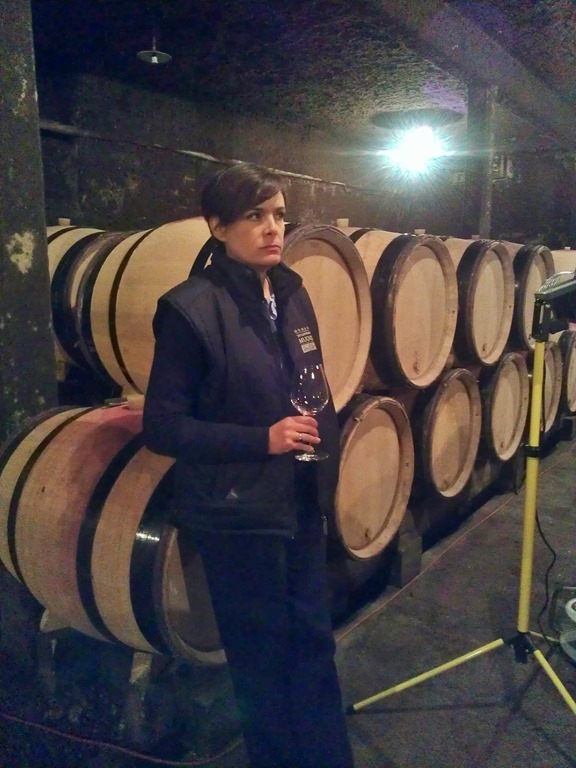 Visiting Domaine Mugnier is always one of the highlights of my trips to Burgundy. Freddie Mugnier is one of the world’s greatest winemakers and he just radiates coolness even when I am exploding with florid descriptions of his amazing wines. I certainly did that during this tasting. Then, of course, there is Freddie Mugnier’s right-hand lady Audrey. Audrey is a wonderful, charming host for tastings who talks knowledgably and enthusiastically about the estate’s wines. She is also perfectly happy to give me a good ticking off if I say anything that doesn’t meet with her approval. Tells me off severely, I might add. This, together with her sculpted good looks and winning smiles when I say the right things, mean that I have developed a bit of a crush on her. She’s married, alas, but I am confident that if I turned up the charm even slightly the poor fellow wouldn’t stand a chance. Hooray! Surely barely-employed, insane, tall, charismatic wine-writers are highly desirable so I feel I’m definitely in should I swallow enough in a tasting to get up the Dutch courage to ooze dashing availability. But let’s move onto the wines. We tasted a couple of 2011s from cask, a little flight of 2010s which were in tank ready to be bottled, and a vertical of Nuits-Saint-Georges Premier Cru Clos de la Marechale from 2010 to 2007. I’ll start with the 2011s. 2011 Chambolle-Musigny Premier Cru les Fuees was showing highly attractively. It had a lot of fresh, attractive fruit that seemed in good balance with an energetic acidity and lovely, silky tannins. This promised much and I look forward to tasting it as a finished wine. Irksomely the 2011 Musigny Grand Cru was quite reduced and difficult to taste. Using my imagination it seemed to have a good texture and impressive depth of flavour, but it was a real demon to taste and extract much information from. Sadly the 2010 Chambolle village was not available to taste. Mugnier had lost 40-50% of the crop in the vineyards that produce this wine due to frost, so there is not going to be much for us to buy. Certainly not enough to give a slurp to a dashing, deserving wine-writer, it seemed. The 2010 Chambolle les Fuees was just a darling. Elegant, harmonious with great finesse and plenty of depth of flavour to keep you interested. The fruit was very ripe and acidity good. This was seriously lust-worthy, assuming that you find loving things easy because they’re beautiful. That’s a less shallow attitude to have about wine than people. Chambolle-Musigny Premier Cru Amoureuses from Domaine Mugnier is always a drool-provoking pleasure and 2010 was a great success. The ripe powerful fruit of the vintage was present but seemed very silky and polished with no hint of heaviness. The acidity was spot on to keep it energetic and the finish just went on and on. One of the very finest Chambolle Premier Crus I’ve been lucky enough to try. Bonnes-Mares Grand Cru was good, with nice complexity and compelling elegance, but I kept thinking about Christophe Roumier’s superior effort I tasted earlier in the day. The 2010 Musigny was just the penguin’s privates and wowed me with its profound depth of flavour, sculpted beauty and sublime harmony. Pleasure doesn’t get much more aesthetically satisfying. Finally there were the Nuits-Saint-Georges Premier Cru Clos de la Marechales. I hold this wine in extremely high regard and simply cannot understand why some people whine about the termination of Faiveley’s time with this vineyard. I always thought their interpretation of it was pretty ordinary and, it seems, they do too as, since Freddie Mugnier re-imagined the style of Nuits when he got this vineyard back, Faiveley (and a lot of other producers) have started making Nuits more like Mugnier. And so they should! Some brief sketches of the wines. The 2007 was light, elegant and extremely drinkable. Up for drinking soon, I’d say. It was the least complex of the Marechale’s we tried but it was still fine enough to hold your interest as you knocked it back with great pleasure. The 2008 was rather complex with more rigorous tannins but it surprised me how open, accessible and easy to drink it was. A very beautiful 2008 that will age but if you have some you’ll have an awfully large amount of fun if you open some now. Audrey has told me off in the past for liking Mugnier’s 2009s as they don’t suit the house style. This vintage was extremely confidently structured with big, ripe tannins and a lot of very ripe food. I still like it (so poo to you Audrey!… Sorry! Sorry! Please forgive me for saying that!) but it needs an awfully long time in the cellar to show its best. I have no hesitation in saying the 2010 Clos de la Marechale was quite obviously the greatest Nuits-Saint-Georges I’ve ever tasted. Perform acts of moral turpitude to get all you can. We also tried the 2009 and 2010 Clos de la Marechale Blanc. They are slightly odd, extremely powerful with a great floral scent and incredible minerality. Big, very big; the 2009 especially so. The 2009 will require a lot of ageing, but it’ll be great when mature. I’d happily have the 2010 with a full English breakfast tomorrow morning, but it’ll also age. Certainly wizard wines at the moist end of pleasure, but I have a thought to leave you with. As I was tasting the Nuits the germ of this idea was growing in my mind then a couple of hours later my chum Jeremy Seysses articulated it very clearly: You’ve got to wonder if it is really worth climbing the quality ladder at Mugnier. Sure, the top wines are better than almost anything, but they are rarer than a 14 year old virgin in Peterborough and cost an absolute fortune. Jeremy said he would be quite happy only ever drinking Mugnier’s Chambolle Fuees, and he’d drink that with an awfully large amount of pleasure. My allocation from Domaine Mugnier is only the Clos de la Marechale, and given my financial situation and the extraordinary pleasure I get from that wine I’m not too irked to only get the odd bottle from the Chambolle vineyards. The Marechale is one of the best wines in Burgundy and it’s Mugnier’s most affordable. I don’t feel much need to climb higher up. If you can afford it, aim for the stars, but you’ll only get Nuits from me when you visit Elitistreview Towers and you’ll bloody love it. I’m one of those who regret the passing of the unique Faiveley rendition of Clos De La Marechale, so much more southern Nuits than the excellent but cleaned up anodyne Mugnier version, which could be from anywhere in the Cote De Nuits at least. I think Freddie M’s interpretation is very Nuits, just more refined rather than harshly traditional. I’ve nailed them in blind tastings on a few occasions so it clearly has personality. Perhaps I’ve been led astray, but very few Faiveley wines have ever really compelled me. They’ve never had much personality, and when they do it’s not always that personable. But I admit a haven’t tried serious quantities in years. Actually I think I might be the only one who regrets its reversion to Mugnier. I do feel about the old Faiveley wines, though, rather as Jeremy does about the Fuees. All down to personal taste in the end, of course. Moi aussi re the 2010 NSG CdlM. So v pleased to have a 6 pack of this superb effort – not to be touched any time soon though. Such a shame about the Chambolle village.